With a Bachelor of Fine Arts degree in Design and over 20 years of experience practicing Feng Shui and many Energy Transformation modalities Beth offers consultations focused on optimizing the Yin and Yang relationship of your inner and outer worlds and the thriving wealth that can result when that union is in harmony. She offers both in person consultations in Southern California and throughout Arizona and distance consultations in all other locations. She has had extensive and varied professional Feng Shui training in Traditional Feng Shui with Masters Peter Leung, Larry Sang, Shyan Tseng, Baolin Wu, Ken Lai, Raymond Lo, Yap Chang Hai and Joey Yap and been a contributing writer for Feng Shui for Modern Living Magazine and The Feng Shui Quarterly. It is the natural order of things in the Universe as well as in our personal lives to be moving forward in growth and increase actively adding to ourselves in every moment in a continual state of Creation. You may notice that if ever you feel stuck in a rut or disconnected from this natural flow in any way you experience a kind of "poor" feeling. My goal is to empower you with effective ways of moving freely again in the direction of a rich harvest. With the vibrational chi fields emanating from both you and your environment cleared, expanded and working together in resonance, you are free to consciously create your life and your business as "a work of art" built on a foundation so whole and strong that it will support your grandest dreams. Why the name "Red Peony?" Many people have inquired about the significance of the name of my company Red Peony Consulting. There is a special symbolic significance attached to this magnificent flower. In bloom it is unusually abundant and invites butterflies and hummingbirds to gardens bringing more color, life and vibrancy to the environment. 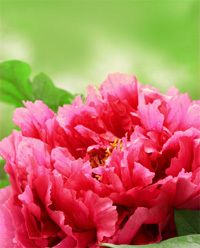 Since the color red is regarded as a vital life giving color, red peonies are particularly admired and highly prized. In China traditionally the peony is known as a "royal flower" that symbolizes wealth, honor, nobility, loyalty, marriage, fertility and beauty. Form School is the most ancient, basic and powerful school of Feng Shui. No special or advanced techniques can have much effect if the Forms are not good. Rearranging the interior and designing an auspicious landscape can uplift us in many ways, but these shifts are not just psychological. Creating these visible changes also changes the invisible energy flow around us, making it possible for the inhabitants of the space to live and work in a healthier, more productive and better flow of vital energy. Having strong support and beneficial chi flow in the interior as well as in the exterior surroundings of your location is crucial. If there is weakness here, it must be addressed before anything else. 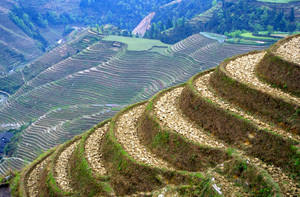 This school of Feng Shui focuses on the favorable flow of air, water, light, roads and traffic, as well as the shape of your property and all surrounding structures, plots, and landforms such as hills, mountains, waterways, streets, driveways, or pathways. The Eight Mansions School is a compass school method, used to determine the nature of the directional energies for people and for houses. Each of the eight compass directions resonates to a specific type of magnetic field, and quality of chi. This is another framework for understanding how the same direction may have different effects on different people. For example, why do certain people sleep better with their heads pointed in a certain direction? Analyzing the interactions of environmental and human chi through the Eight Mansions method we can understand from another perspective why we feel more comfortable or productive in one location rather than another and how to use each direction to best advantage. Flying Stars is a mathematical system that can tell us how and why the quality of chi in a particular location changes over time, and what we can do to continually harmonize with the ongoing energetic changes brought about as Time marches on. A good practitioner can harness the beneficial chi in the different cycles so that their client buys rents or builds as the chi is strengthening and not weakening. In Feng Shui water is associated with Money Luck. “Waterways” whether they are natural or man made, actual water or symbolic water, are essentially pathways of energy. They have the power to conduct gather and disperse chi. There are at least two specific areas for each particular house, where placing water must be avoided. The ability to tap into the auspicious water chi and activate it with authentic methods and implementations is an advanced skill that can potentially elicit more abundance into people’s lives. Da Gua is about the romance of yin and yang. It’s about open and closed spaces, movement and stillness. It’s about finding a good match for these “couples.” The visible forms can be considered Yang, and they must mate with the right type of Yin energy, which includes the timing and invisible chi, in order to conceive and produce an auspicious result. In this school of Feng Shui we incorporate knowledge of the 64 Hexagrams of the I Ching Book of Changes to determine which hexagram is at your front door and which hexagram influences your bedroom, in order to help people to increase finances, improve their health and conceive a baby. Qi Men Dun Jia is both a predictive tool and a date selection method to capture the best qi energy at the best time for what you want to do. This highly secret ancient teaching is rarely known of and practiced in the West. It is a way to quietly slip into a brief window of time and influence events to turn out in your favor. It can be applied to all matters of importance such as personal and career goals and projects, business, wealth luck, taking exams and academic achievements, making applications, travel planning, medical appointments, filing lawsuits, Feng Shui adjustments, redecorating, building, moving, buying or selling important things, gambling, lottery, stock market trading, marriage and other relationship issues.